Programming your requirements without Programming. Accounting SoftwareFree Download Downloads ERP Brochure, Installation Guide, Free Accounting Software Brochure More..
"Goodwill is very easy, simple and useful software for every Organization." "Goodwill is an excellent Package I did not know that there was such a versatile Accounting software which has all the features of an ERP." "Goodwill is a tool in the hands end users to Customize their requirements." 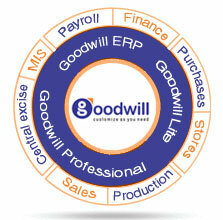 "Goodwill ERP is an excellent software and got customized within 2 weeks. Central Excise, VAT and every requirement of ours is delivered. Even we work remotely from our Branches. I really wondered for the implementation."